Bin tippers are the ideal choice for a vast array of unloading needs in farms, warehouses and other industrial environments in Australia. They are designed to assist on-site operations and provide safe, heavy-duty tipping for all kinds of materials, ranging from poultry to gravel. Given their fast-controlled hydraulic tipping action, they speed up operations and ensure a clean, organised workplace. Our Forward Bin Tippers are known for tipping millions of tonnes of products in a vast array of industries over the years. They are balanced precisely to tip with ease and return the bin to an upright position once the dumping is complete. AIM Bin Tippers have a clear view design that does not obstruct the loaded tines and ensures minimal loss of forklift load capacity. With only a few modifications required to fit any forklift, the AIM hydraulic bin tippers are easily attached and detached. The forklift tipper is a quickly fitted solution, and does not restrict the normal operation of the forklift, which includes the ability to carry stacked bins and pallets and unload parts from trucks and production lines. Our very own Bin Tipper has a powder coat finish with minimal maintenance required. 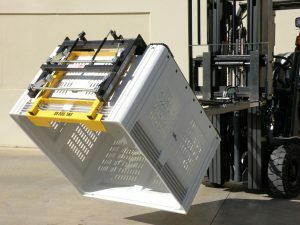 They have a unique bin grip that applies a firm hold on bins when inverted. They are suitable for an extensive range of cubic bin sizes and types, including timber or plastic, solid or vented. Promising robust construction, you can expect years of trouble-free operation. Each Bin Tipper has a safe working load of up to 1000kg, making it a suitable equipment for demanding unloading requirements. It has a total width across tines of 760mm and fits standard forklift tines with dimensions of up to 1070mm x 45mm x 125mm. Weighing in at 155kg with a horizontal centre of gravity of 600mm and a vertical centre of gravity of 90mm, the AIM Bin Tipper is a stable tipping system, no matter the conditions of the work environment. AIM Sales is a trusted distributor and manufacturer of high-quality agricultural equipment in Australia. We employ advanced in-house manufacturing techniques and have full control over our supply chain. We serve clients across Australia and abroad with unwavering commitment to excellence. Our team places value on detail, making sure we meet every aspect of your requirements. With the quality and speed of the service we provide, we are a company you can trust.